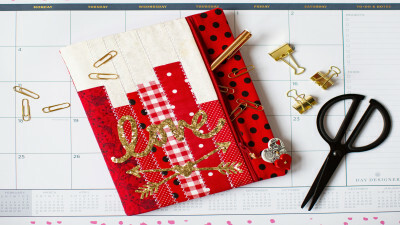 If you’re a traveler on the go, you simply must make this fun passport wallet! 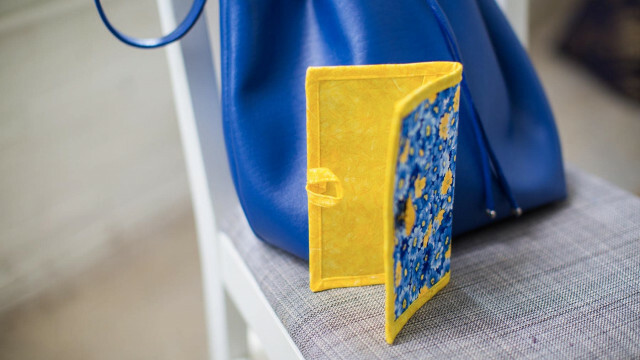 Never lose this important document in your purse again when it’s in a bright and colorful protector. Make this easy project on your new Baby Lock Accomplish! Download printable instructions. Set up the machine for sewing. The thread used should coordinate with the fabrics. Draw a line across the center of the buckram using the Frixion pen. Place the main fabric and the contrasting fabric on top of each other. Pin the buckram to the top and cut out both fabrics ½” larger all the way around than the buckram. Place the buckram on the wrong side of the lining fabric. Pin in place. Stitch the two together on the drawn center line on the buckram. Stitch all the way around the outer edges of the buckram. Trim off excess fabric by cutting very close to the stitched line. Be careful not to cut into the stitched line. With wrong sides of the fabric facing each other, place the lining section on top of the main fabric. Pin to hold in place. Stitch very close to the outer edge. Trim off excess. Cut two pieces from the vinyl that measure 6 5/8” x 3 ½”. Trim along the top edge on both of the sections so that they have a slight curve. You can also leave the edges straight. Bind the two top edges on the vinyl using the bias tape. Trim off the bias ends even with the vinyl. Pin the vinyl pockets over the lining section so that the opposite unbound ends lining up with each end of the wallet. Pin the pockets to the wallet. Baste the pockets to the wallet close to the outer edge to hold in place. To create the button loop, cut a 4 ¾” length from the bias tape. Stitch along both edges to give a nice clean edge. Fold the section in half and center the loop on the inside left side of the wallet so that the fold on the loop face outward. To secure the loop, sew in the seam line on the wallet. Sew the button to the outside on the right side of the wallet. Do not stitch through the vinyl but catch the outer fabric only. Slip your passport into the wallet and enjoy your trip!